The fight for Medicare for All in Massachusetts is heating up this summer! 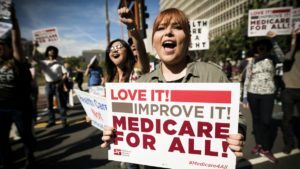 We are reaching out to friends, neighbors and co-workers about how Single Payer works, why we need it, and how it can be achieved. Many local candidates for seats on Beacon Hill have attended our events to learn more about it. Another Outreach Training will be held Sunday, July 22nd in Holyoke, with a few seats still available. To registersend your name, phone number and zip code to Beth: jubilada[at]icloud.com. Our local hubs are busy this summer canvassing, sending visibility teams to candidate forums, tabling at events like the recent Green River Festival, and building support for the Single Payer non-binding ballot question that will appear on the November ballot in six local legislative districts. We always welcome new people! If you’d like to get involved, contact us for more information. You can also help support the movement for Medicare for All by donating to WMM4A. Western Mass. is a leader in the state for grassroots organizing. We run on amazing volunteer energy, but we do need money for literature, events, and online resources like this website and our listserv. Please consider a donation to help us reach as many people as possible.